Preheat oven to 375. Season eggplant slices with salt and pepper. Brush lightly with olive oil. Heat a large skillet or griddle pan over med-high heat and fry eggplant slices in batches until golden on both sides. Set aside while you prepare the creme fraiche. Place creme fraiche or cream in a small saucepan and bring to a simmer over medium heat. Reduce to about 1 cup, then stir in half of the grated parmesan and all of the chopped herbs. Season with a pinch of salt and pepper and set aside. Oil a 9″ casserole or gratin pan and place eggplant inside in a single layer. Cover with a thin layer of simple tomato sauce and a sprinkle of parmesan. 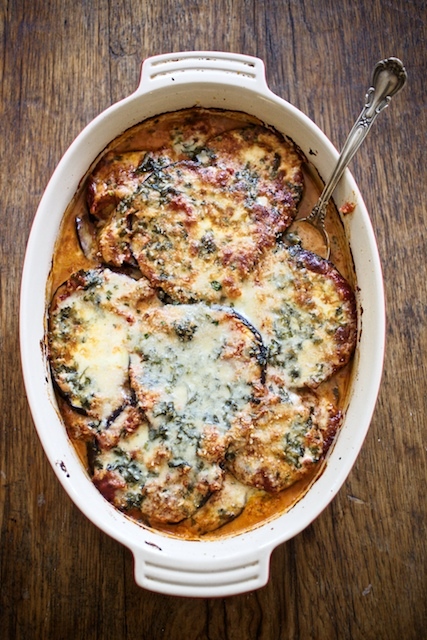 Make two more layers of eggplant and sauce, covering the top with tomato sauce. Ladle over the reduced creme fraiche or cream and sprinkle on a final layer of parmesan cheese. Bake uncovered until browned and bubbling, about 25-30 minutes. Let rest briefly before serving. Also delicious at room temperature.